It's been a looooong road, but the last paper from Mike Venarsky's dissertation finally came out in print in Ecosystems this month. 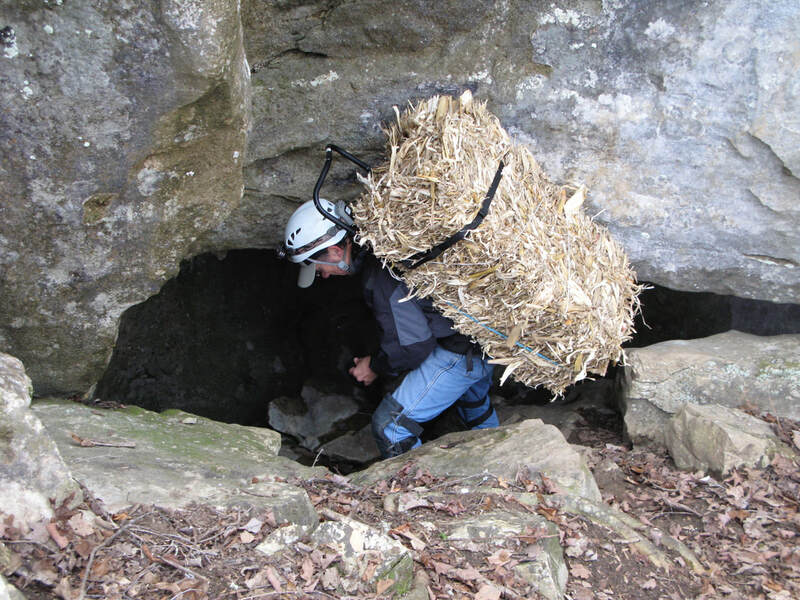 The paper describes the results from a year-long addition of corn detritus to Bluff River Cave in northern Alabama. It's hard to believe that we started the year of pre-addition data collection for that experiment back in February 2009. Ouch. 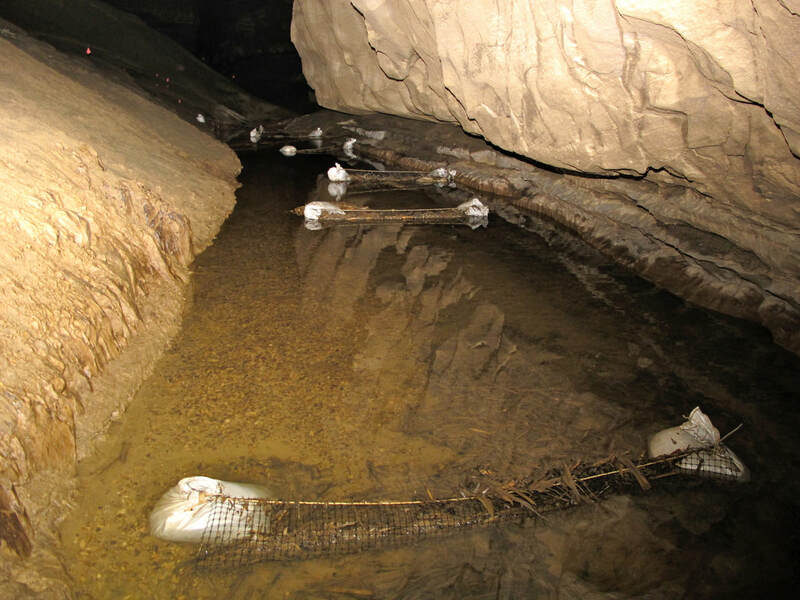 The whole idea was to conduct a proper experimental, whole-ecosystem test of carbon limitation of cave food webs. I persuaded Mike and two other lab members to drive all the way to Iowa to buy the corn stover - the nearest place I could find non-Bt corn that was manageably baled in the old-style, 35-lb square bales. Here's a shot of their arrival home. 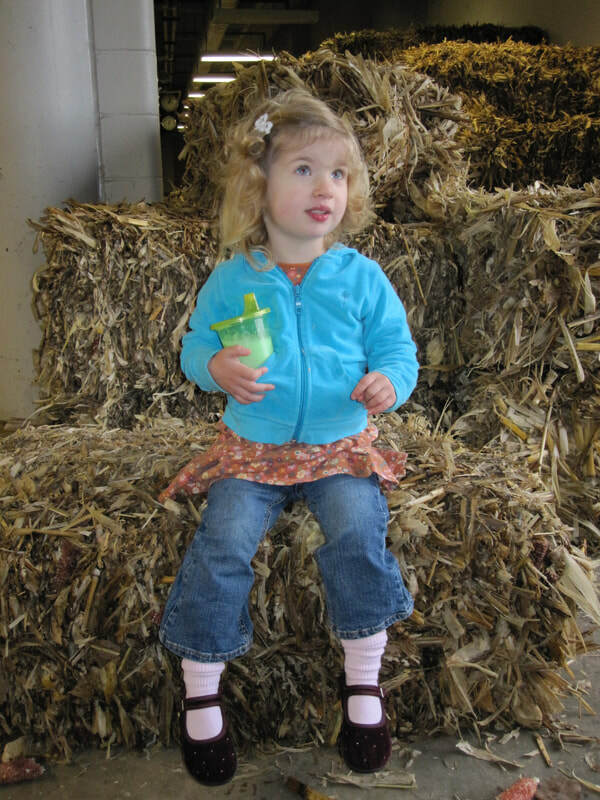 To illustrate the long gestation of many field ecological studies, here's what my now ten-year old daughter Lillian looked like on that day :) Doesn't time fly? 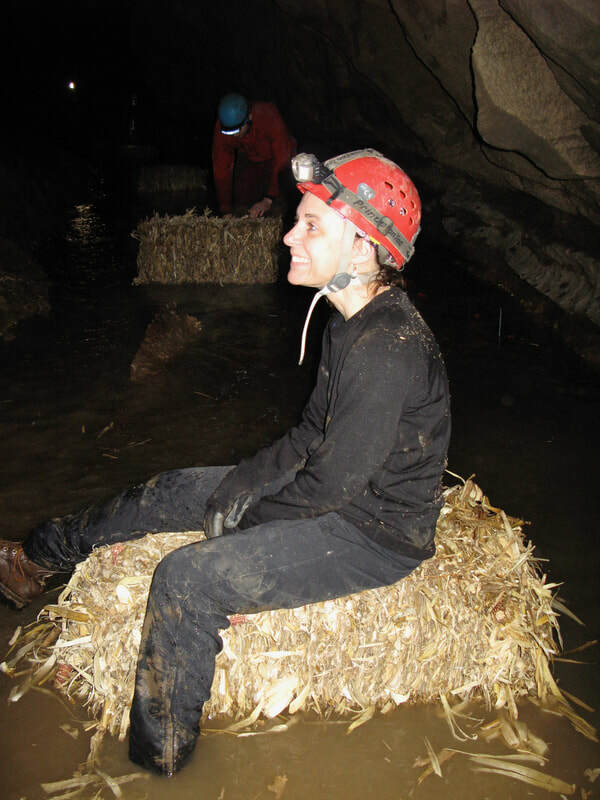 On February 12, 2010 we started putting corn litter in the cave, with the indispensable help of a bunch of volunteers from local caving groups. 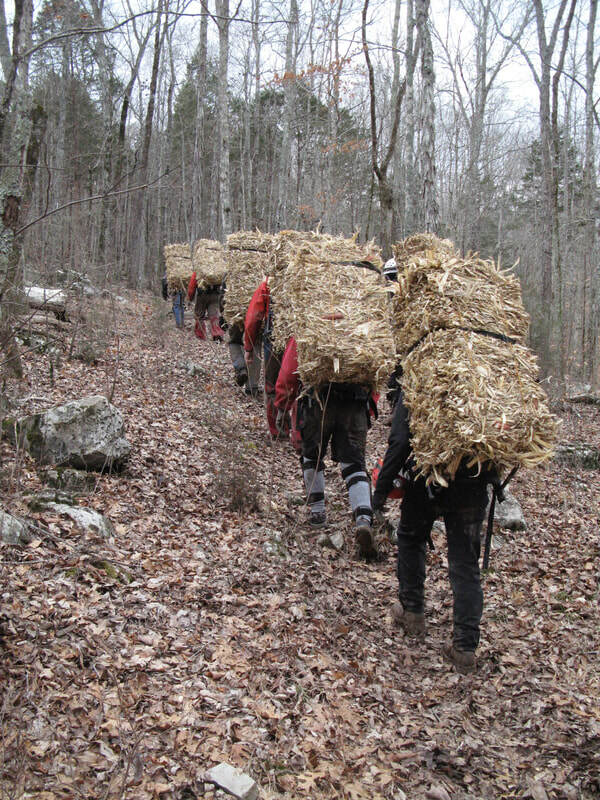 I love this shot of the bale convoy heading through the woods to the cave entrance. Finally, here's a shot of the manipulated reach, complete with the retention devices Mike put in to slow the progress of the corn stover through the system. It was a ton of work, especially for Mike Venarsky and Brock Huntsman, who did the lion's share of the fieldwork. It was worth it though, despite an often frustrating publication process. Compound-specific and bulk-tissue stable isotope analysis allowed us to track the incorporation of the corn-derived (C4) carbon through the food web, from microbes to salamanders, while comparison of our data with those from a litter-exclusion study in a surface stream showed convergence of their relationships between consumer biomass and organic matter availability. Finally, there were positive responses to increased detritus only among the facultative cave (i.e. surface) taxa, those of the obligate cave taxa presumably being constrained within the timescale of the manipulation by evolutionary adaptations to a low-energy environment. Together, these results highlight that it is low carbon availability, not darkness per se, that really sets the template for cave food web structure. Check out the paper for all the details. By the way, all the stable isotope and microbial work was funded by a NSF dissertation improvement grant to Mike. The paper wouldn't have been nearly so convincing without those analyses. RIP DDIG (sniff!). 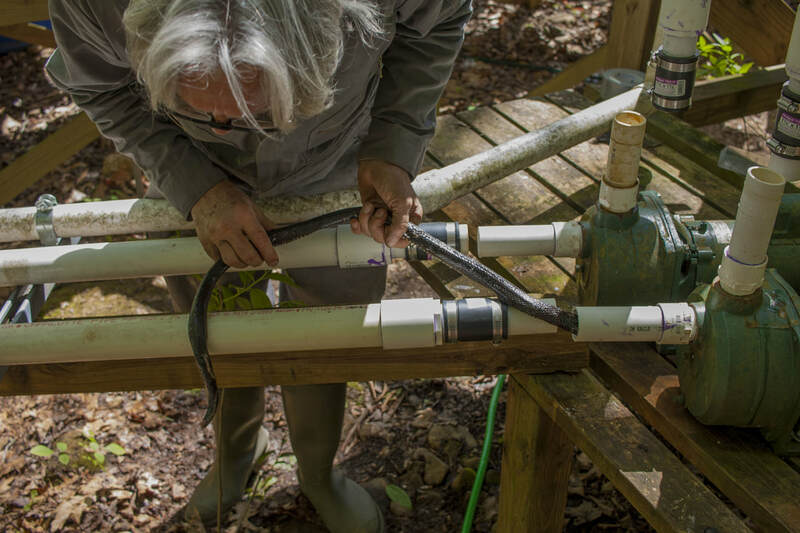 Although sampling and preparatory work has been going on for some time, May 1 was the official start date of our new multi-PI NSF project that will examine the consequences of warming for detrital carbon processing in low-order forest stream networks. For the next three years, we'll be working across the Coweeta basin to shed more light on the temperature dependence of detrital processes, using a combination of natural across-stream temperature gradients, a heated stream-side channel array and a whole-stream warming manipulation. The manipulative experiments won't begin until 2019, so we have a year of sampling ambient conditions ahead of us. 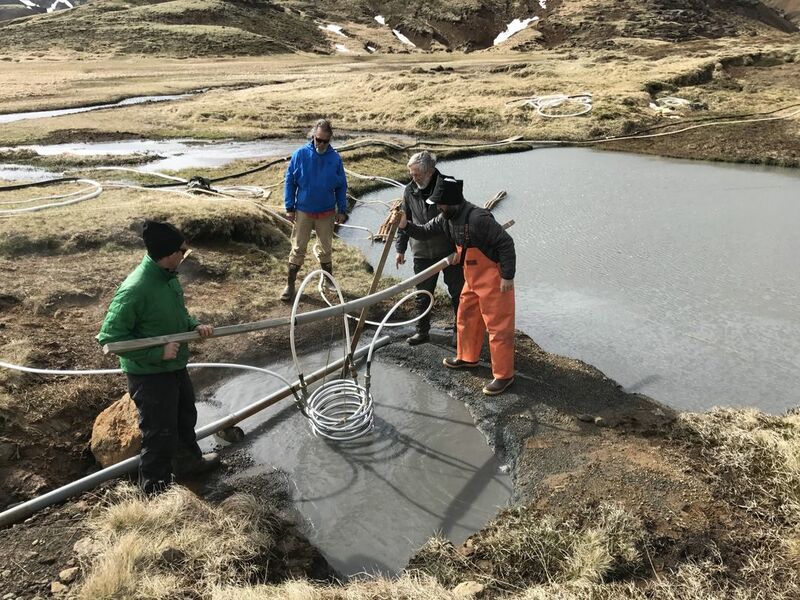 The University of Georgia team has done a fantastic job setting up the infrastructure necessary to construct comprehensive organic budgets for the two streams (reference and experimental) that will be used in our whole-stream warming study. 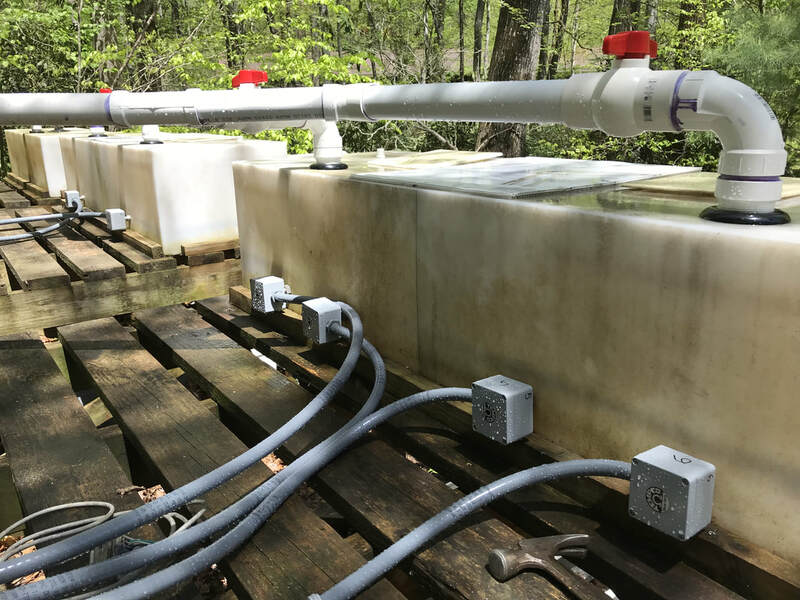 The shot on the left below shows the Coshocton sampler and coarse organic matter trap designed to quantify fine and coarse organic matter outputs, respectively, from the experimental stream. On the right you can see the set of three collection barrels for fine organic matter outputs from the Coshocton sampler in the reference stream. In the meantime, we have been very busy re-purposing the stream-side channels that were built beside Shope Fork at Coweeta back in 2010 as part of our last NSF project there ("SNAX3"), which examined the consequences of dissolved N:P ratios on detrital food web processes. This has involved a complete upgrade of the electrical supply to the channels (to 20 kW! ), splitting and re-plumbing header tanks, and installing the cartridge heaters that will warm the water supplying the channels. None of this would have been possible without the help of our trusty engineer, Dr. Philip Johnson, who was also instrumental in making our temperature manipulations in Iceland such a great success. Here's Philip working on wiring in the heaters, along with a shot of Phoenix Rogers doing some plumbing work. Here's a shot of the cartridge heaters now installed in the old header tanks, each of which has also been split into two. These will allow us to have five temperature treatments, each replicated in four channels. It's exciting that we are finally getting this large project going. Watch this space for more news and photos as we continue our work at Coweeta over the next three years. A bunch of new publications have appeared this year (the eventual products of past rejection woes...). 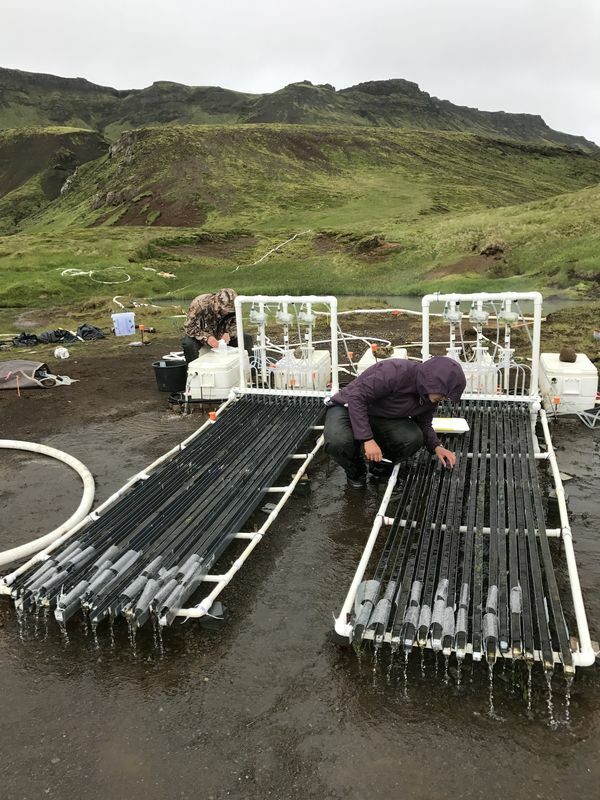 One was Jim Hood's GCB paper that presents the ecosystem metabolism and nutrient uptake data from the pre-warming year and the first year of warming from our whole-stream temperature manipulation in Iceland. As the before-after pictures above show, some of the results were quite dramatic (that's the green alga Ulva, which went nuts in the summer after we began warming by less than 4 degrees C). Post-warming shifts in community structure were also associated with a dramatic increase in the nutrient use efficiency of the primary producers in the stream. 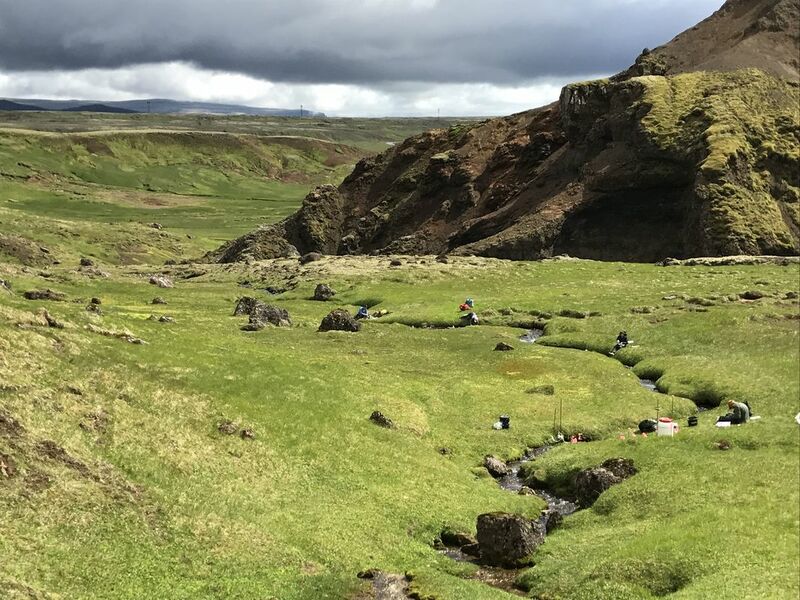 These sorts of interactions between temperature and nutrient cycling are exactly what our research program in Iceland was designed to uncover. Good stuff. Another notable recent publication from the lab is Mick Demi's Ecology paper that describes the responses of five macroinvertebrate communities to experimental manipulations of dissolved N:P. The results are a convincing demonstration of P limitation of invertebrate production in food webs that are based almost exclusively on leaf litter. The plot below shows response ratios of primary consumer production and litter N:P ratio in the five streams over the two years of N and P enrichment (the regression used the average of the two years in each stream). 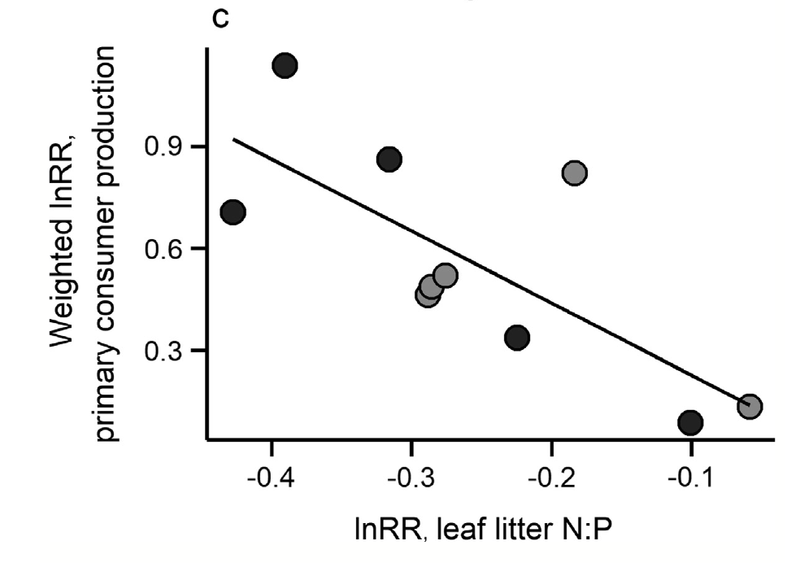 The plot shows that the largest increases in macroinvertebrate production were associated with the largest decreases in the N:P ratio of litter. Well done to Mick for revealing these patterns. Only someone who is familiar with calculating invertebrate production will appreciate what an ungodly amount of work went into a plot like this! We're a bit behind with website updates, but back in January a new lab member arrived. Welcome to Phoenix Rogers, who recently completed his B.S. degree at the University of Wisconsin-La Crosse. Phoenix will be working on a PhD examining the responses of macroinvertebrate communities in detritus-based streams to higher temperatures. He'll be part of a large team working on our temperature project at Coweeta Hydrologic Laboratory in North Carolina. Sampling for the project starts in May, but Phoenix has already done a dry run at the site. A good start! My lab currently has an open PhD position on a newly funded NSF project. The student will investigate the responses of macroinvertebrate communities and stream food webs to a whole-stream warming experiment. The larger scope of the project includes microbial to whole-stream reach responses to temperature that will be used to predict future network-scale fates of carbon, using a multi-scale design that includes the paired-catchment whole-stream warming experiment, an array of warmed streamside channels, laboratory studies of aquatic microbes, and reach- and network-scale modeling. Fieldwork will take place in the Southern Appalachians at the USDA Forest Service Coweeta Hydrologic Laboratory, North Carolina. Ideally, the successful candidate would have a background in entomology and an interest in combining it with experimental ecosystem ecology to examine the effects of climate warming on energy flow through species-rich consumer networks. The position includes a competitive stipend, health insurance and tuition waiver. I'm also hoping to take on a MS student to work on this project. This position would have to be supported by a TA, but would also include health insurance and a tuition waiver. If you're interested, please take a look at my Prospective Students page and email me. It's now almost six years since we followed through on a madcap plan to warm up an entire stream reach at Hengill. It was only made possible by the ingenuity of our engineer, Philip Johnson, shown here on the right (Alex Huryn is providing the muscle behind him). Philip is now retired, but still working with us (and still just for the kicks too). Happily, all that work was worth it. This month Dan Nelson has published two papers from the project. The new one, published in Ecology, extends the results of his recent paper in Global Change Biology to show that secondary production in the manipulated stream remained constant after warming, as predicted by metabolic theory. The mechanism was surprising, however. Rather than total biomass declining and mean growth rates increasing, total biomass did not change. Instead small fast-growing taxa declined as larger slow-growing species, including newly invading taxa, increased in biomass. As shown in his previous paper, Dan's results were driven by somewhat idiosyncratic relationships between body size and thermal preference, and demonstrate how reassembly of communities under warming will depend on the range in thermal preferences and dispersal abilities in regional species pools, which may or may not be related to body size. This is the kind of result that could only be observed with an experimental manipulation of a natural ecosystem that is open to dispersal processes. Which is one reason why we go to all the trouble! I am back from Iceland, after an ultimately successful trip, despite weather that was often difficult and that postponed the start of our five-day 15N additions to the two cold and two warm streams. The shot above is of everyone sampling food web compartments in Stream 11 during the drip. The sun did come out every now and then! The channel experiment continues to go well too. Here's a shot of our REU student Heath Goertzen and MS student Lyndsie Collis collecting and processing tiles for the biomass accumulation time series. You can just make out the diversity of growth responses that are being driven by differences in temperature and nutrient treatments. Some tiles are still effectively bare after six weeks, while a thick algal growth is threatening to overtop some channels. Maybe we'll see some interesting temperature-nutrient interactions. Time will tell. This year the weather did a good job delaying the start of the planned simultaneous nitrogen isotope additions to our four focal streams (two warm, two cold), as we cannot start them if the streams are too high. We finally got a forecast for a break in the weather, so Mick and Jon started the drippers yesterday evening (in truly awful weather, as it happened). The good weather has now arrived and all 8 drippers (one for ammonium nitrate and one for 15N-enriched ammonium chloride and potassium nitrate in each stream) were behaving well when we changed the batteries after one day out of the scheduled five days of isotope addition. Fingers crossed that those five days go off without a hitch. Tomorrow we take our first food web samples from the four streams, followed two days later by comprehensive water sampling for nitrogen concentrations and isotopes. More posts to follow. Our field season in Iceland kicked off last month, so it's high time I posted on our progress. We started off in early May by setting up the channel experiment again, made much easier this year by a notably small snowpack. But first we had to find all the many pieces of the experimental set-up in the new storage facility, where all our gear was moved over the winter. 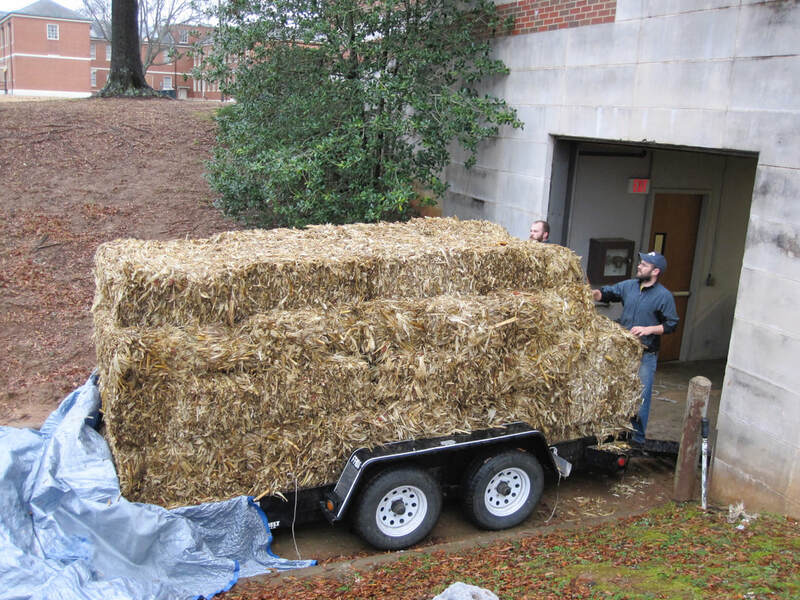 It was all there, so we set to checking it over and packing it up in the truck. For once, setting up the channel experiment went smoothly. Perhaps we're finally getting it down on the fourth iteration. Or maybe it's because Wyatt stayed out of the way and mostly mugged for the camera. In any case, our final channel experiment is up and running. It will explore how threshold responses of biofilm communities to relative nitrogen and phosphorus availability change with temperature. Next up was to get the nitrogen drippers going in the two cold and two warm streams. Six hundred kilos of ammonium nitrate fertilizer will do the job, delivered by the same float-valve drippers we used last year to add phosphorus. It's now mid-June and still early days for our nitrogen additions, but spot the difference. Here are two shots taken yesterday of one of our warm streams. The left photo is just upstream of the nitrogen dripper, while the other shot is just downstream. Note the particularly lurid green clumps of Cladophora that start directly below the dripper. The isotope additions to the four streams will start in the next few days, so watch this space. It's been a bit quiet on the publication front of late (we had a very sobering run of rejections last year), but Dan Nelson's first manuscript from his dissertation is now out in Global Change Biology. 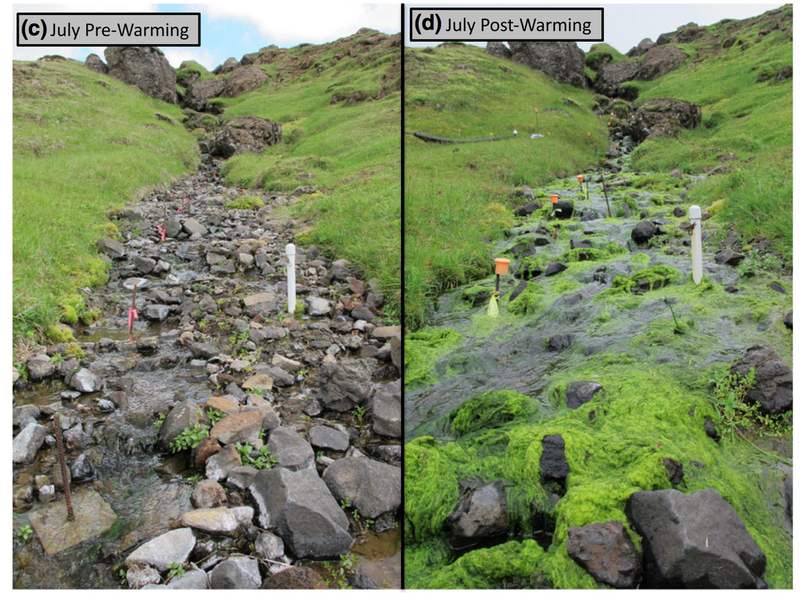 In it, we describe how the experimental warming of a small upland stream in Iceland by 3.8 degrees C changed the structure of its invertebrate community. Somewhat surprisingly, average body size increased. The landscape in which the stream is embedded has streams of varying temperature, which contain taxa with a wide range in thermal preference. It just happens that many of the invertebrates with higher thermal preference are relatively large-bodied (snails and black flies, for example) and these groups responded strongly to our whole-stream warming manipulation. These results show that shifts towards lower average body size with warming are not universal, and that the combination of diversity in thermal preference and dispersal ability will dictate how communities reassemble as ecosystems warm in the future. Well done to Dan for all the hard work he put in to reveal these patterns!